The issue of dimming damaged the image of CFLs when they were first introduced. It could yet do the same, or worse, to LEDs. 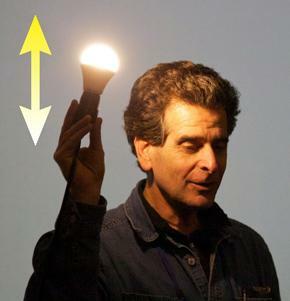 Inventor Dean Kamen holds an LED light bulb in this photo by Jason Gessner. Quick, name the issues that have already cast doubt, in the mind of the public at large, on the usefulness of LEDs for general-purpose lighting. They produce a harsh, bluish light. They shift in color over time. They don't last nearly as long as claimed. They are described in terms that we (the general public) don't understand. Did I miss any? 1. is far less an issue than it was half a decade ago. 2. is fixed. 3. is fixed, if you buy a reputable brand. 4. is still a looming problem, because we are coming to appreciate fully that the lifetime of a lamp or a luminaire is limited by factors that go beyond the lifetime of the LED inside. We are beginning to see years-long warranties, but also questions of whether they are worth anything. 5. is an ongoing problem, as Blaine Bateman's post this week made eminently clear (see: Internet Offerings of A19 LED Bulbs). But the problem of dimming could put all those in the shade. As Lux Review's Ray Molony put it, "The truth is, the lighting industry has created a monster that's confusing everyone." The link above includes a dramatic dialog that might take place between a lamp supplier and a lighting designer or consultant. It is worth reading through. Molony sums it up this way: "It took us decades to solve the problem of dimming fluorescent, and it looks like it'll take us a while to get to grips with dimming LEDs." [First,] many existing dimmers, designed for incandescent or halogen lamps, will not work properly with the majority of LED lamps. Secondly, there is no standard across the industry that regulates the performance of dimmable LED lamps. Finally, some lamp manufacturers are producing dimmers that are only compatible with their own lamps. Paul offers as an example of a well-designed driver the "isolated, TRIAC-dimmable, high-power factor, universal input, 14W LED driver based on a Power Integrations LinkSwitch IC." Other ICs and drivers are reaching the market that aim for a similar level of generality in accommodating dimmers of different types. We in the SSL business had better get our act together on dimming, or we risk another major wave of disillusionment among the general public about LED lighting.